Since we just celebrated Valentine's Day on Sunday, I figure it's great timing to share what I gifted Joel this year. For this particular holiday, we do it a bit different than I used to picture Valentine's Day to be. Let me just say, I ADORE Valentine's with my husband. We both have birthdays this month sandwiching the 14th right between them, so we agreed that anything we do for this day would either be very small or something for 'us.' With that being said, I knew this would be the perfect time to execute a gift I've been wanting to do for Joel for years, because it's really a gift for us both. Done and done. So, what'd I do? I planned an entire year's worth of dates! It's the gift of time really. Making a conscious effort to keep dating your spouse is so important in a marriage! The longer we've been married, the more we value our date nights. We will be celebrating our 7th anniversary later this year, and I love knowing there's still a plan for date night. Pursuing each other just deepens our commitment in this marriage and this family. If we're not taking care of our relationship as husband and wife, how can we expect to take care of our family's bond? Plus, I love having an excuse to dress up; what girl doesn't? Ammmiright? SUPPLIES: I used A2 envelopes and folded cards for this, as the size was perfect. I love the Paper Source line and use them for most of my projects. These envelopes are the gravel color, and I used the luxe white folded cards. The thin brush is from Hobby Lobby for the brush lettering, and the bigger brush is an old brush I picked up on travels to China in college. Any bigger brush will work here, as it's used for a brush stroke look on the envelope. You'll need a calligraphy nib and penholder (used for lettering each card inside) if you want to make the inside real fancy. Windsor and Newton gouache in black and white (my favorite for use as ink or painting). And lastly, some wax seal supplies. I found mine on Etsy through this seller. ENVELOPE: This is the front and back of each envelope. It's pretty simple, but I love how it came together. I wanted to keep the vibe modern, but casual and inviting, yet a bit of a mystery with the black wax seal. First, I laid out all the envelopes on my work surface in preparation for the white brush stroke in the center of each envelope. I mixed my gouache to the consistency of 1 part gouache to 1 part water. It should be kind of like whole milk or cream in consistency. Then go to town! Since you'll have to order a minimum of 2 packs of envelopes for this project with how Paper Source sells them, you'll have enough for mistakes or practice strokes. Once those are dry, prepare the black gouache in the same fashion. You may want to practice your lettering style on a separate sheet of paper before you go to the envelopes, just to make sure you like what you're about to do. Don't over think this part. The lettering is meant to be more casual than fancy, so don't worry if it's not exactly as you imagined. This is actually the lettering style I've been doing for any mail sent out by Xander or for baby showers. It's young and casual, yet bold and fun. Clearly my favorite lately since I've been doing it alot! WAX SEAL: Sooooo, be sure to plan enough time for this portion. I'm not the best wax sealer, but whatever. It works. It'll just take some time to melt all that wax! Just don't try to rush the process. If you get the kit from the Etsy seller I listed above in the supplies, I believe they include instructions on how to use it. I bought it a while back, so those instructions are long gone if there were any. Anyways, you got this! Is that instruction enough?! hah! So here's how the envelopes look as a whole! I'm sorry I couldn't show an image of the final outcome of the folded card. I photographed this set after I gave it to Joel (I couldn't open one just yet!). So you'll just have to imagine it. Each card has the month on the front written in black calligraphy(a teensy bit fancy! ), and the inside is filled with the cash or gift card(s) with a written intention for that month's date. Easy enough, right? Just trying to keep it simple, yet beautiful for this gift. To get the juices flowing, here are some date ideas you might want to implement if you plan on doing your own year of dates! 1. Go try a new restaurant. If you're in an area with a surplus of up and coming restaurants, veer from your normal path and try something new together. 2. Take a cooking class. Joel signed us up for a cooking class one time and it was such a hit! We learned to make crepes together during the course. Something we'd definitely do again in the future. 3. Dinner and a movie. Classic. 5. Go big! Have a favorite restaurant you like to splurge on together? This is more of the "special occasion" dining for us. How exciting would it be to include that in the set?! 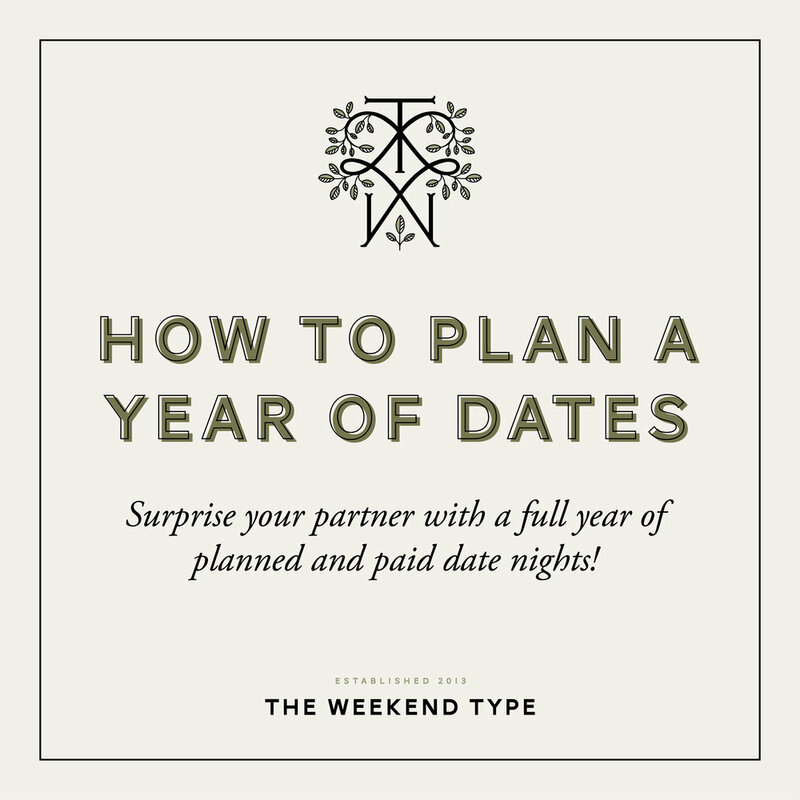 It'd be extra fun to have that date planned for a time of the year it's least expected. 6. Breakfast date. I'm a big fan of breakfast. So any date that includes breakfast, you can certainly count me in. It just starts the day off perfectly! There might be more than one in my set here :) Don't even act surprised, Joel. 7. Stay at home date. This could be anything from cooking a delicious meal together (and possibly dessert! ), to a chocolate and wine tasting (at home of course. Just go get a lot of different chocolate and a few bottles of wine you can open!) with a movie, to even a "spa night" at home. For the last one, think lavender candles, dark chocolate covered strawberries, cucumber water, and foot rubs...all while the kids are asleep. SOUNDS SO GOOD. Right, mamas?! hah! 8. Do something active together. Before I got pregnant again, Joel and I had gotten into going rock climbing. We would turn it into a little afternoon date since it's across town and grab lunch on the way home. It's a simple activity, but it's active and something we enjoy doing together. Why not make it a date? It's all about spending time together after all. I hope you enjoyed my first DIY post here on the blog! Thanks so much for stopping by and taking the time to read this! I'd love to hear your thoughts on Valentine's, dating your spouse, and date ideas in the comments below! Feel free to share your thoughts to keep the conversation going!